This tutorial shows how to create, edit and populate checkboxes, radio buttons, list and dropdown list boxes in PDF forms via a mail merge process. These fields work differently than text form fields and require a special approach. The tutorial explains how to automatically populate these form fields using data from a spreadsheet via AutoMailMerge™ Plug-in for the Adobe® Acrobat®. How to check a checkbox or radio button, or select an item from a list box using mail merge? How to create a checkbox and edit its export value? 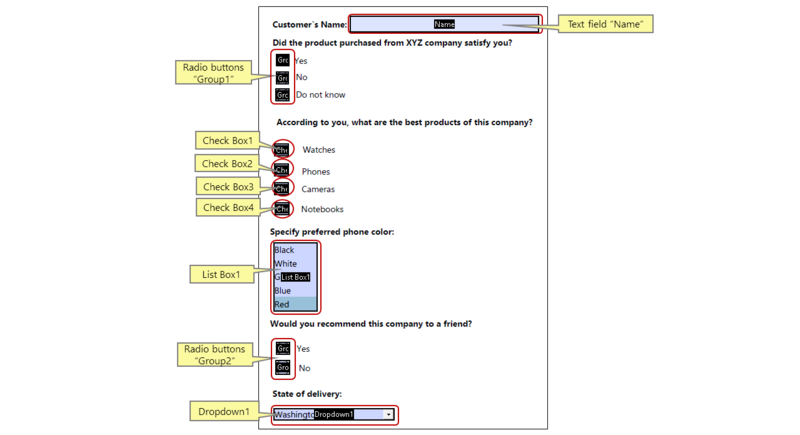 How to create a radio button and edit its export value? How to create or edit list of choices? How to create or edit a dropdown list? 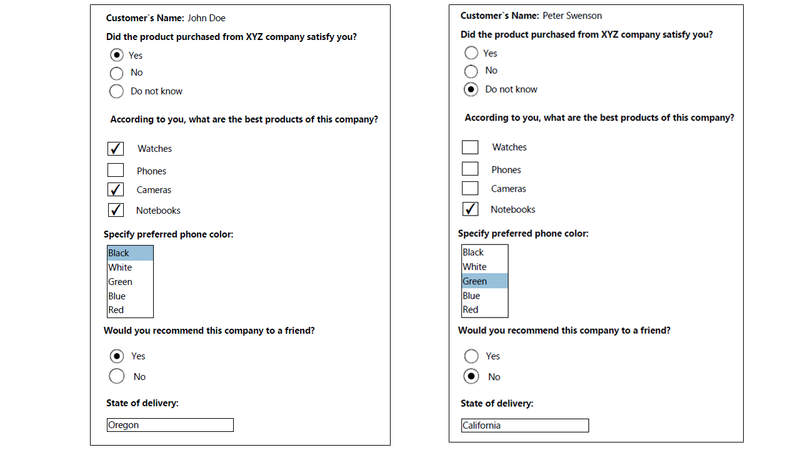 Read more about creating interactive PDF forms in Adobe Acrobat. The "export value" of "Yes" is used as a defaut value for all checkboxes created in Adobe Acrobat. However, depending on the project requirements, it can be virtually anything such as "Male", "Female", "Dependent" and etc. The export value is typically selected based on the way filled PDF forms are going to be processed. 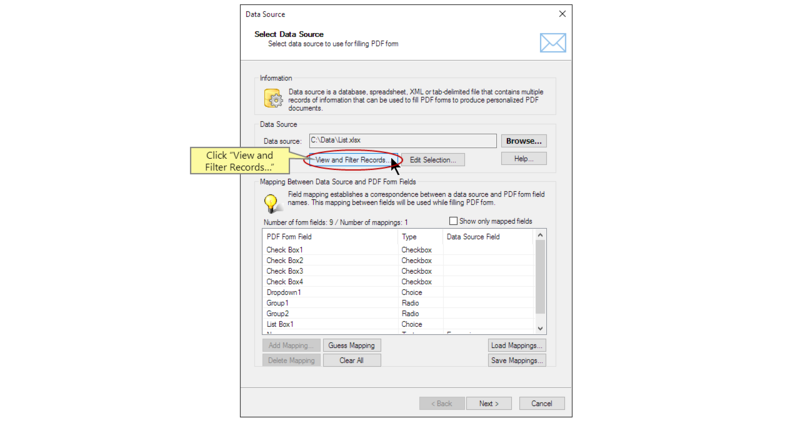 The value of the checkboxes should be selected to match the way the corresponding values are listed in the data source that will be used for the mail merge. For example, by default, the Adobe® Acrobat® defines export value for a new checkbox as "Yes". See the example image above. Please note that this value is case-sensitive, filling a checkbox with "YES" or "yes" will have no effect. If you want to make a PDF checkbox appear checked using a Yes/No field value from MS Access/Excel or any other database, then you need first to figure out what values those field are "exporting". By default, these fields export 1 (if Yes/No field is checked in the Access) or 0 (if Yes/No field is unchecked in MS Access). However, it is possible to change those values in MS Access. This is important to check what "actual" values are stored in corresponging data fields. If using AutoMailMerge, navigate to "Data Source" tab in the Settings, and click "View and Filter Records..." button to preview data. Check boxes present yes-or-no choices for individual items. If the form contains multiple check boxes, then user can typically select as many or few of these as wanted. Start the Adobe® Acrobat® application. Select the "Tools" from the main toolbar. Select the "Prepare Form" tool to open a form editor. Select an existing PDF file that will be used as a template for the PDF form. Click the "Add a check box" icon from the menu. Move cursor to a page location where you want to place a checkbox field. Click on the page where you want to place a checkbox. Enter a checkbox name. 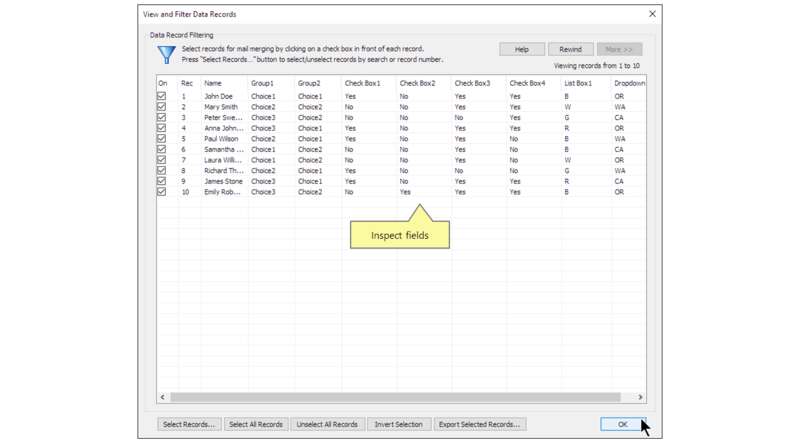 Checkbox names are used to uniquely identify each field on a PDF form. It is a good idea to use the same name for both form and data fields to simplify the field mapping. Click "All Properties" to specify checkbox properties. If editing an existing checkbox, then place a cursor over it and click a right mouse button. Select "Properties..." from the popup menu. Select the "Options" tab on the "Check Box Properties" dialog. Select a check box style. By default the Adobe® Acrobat® defines export value for a new checkbox as "Yes". Verify value in the "Export Value:" field. Use this text to check this particular checkbox or change it to a different value as necessary. Use the same value in the corresponding column in the data file. Click "Save file" to save changes to the PDF file. 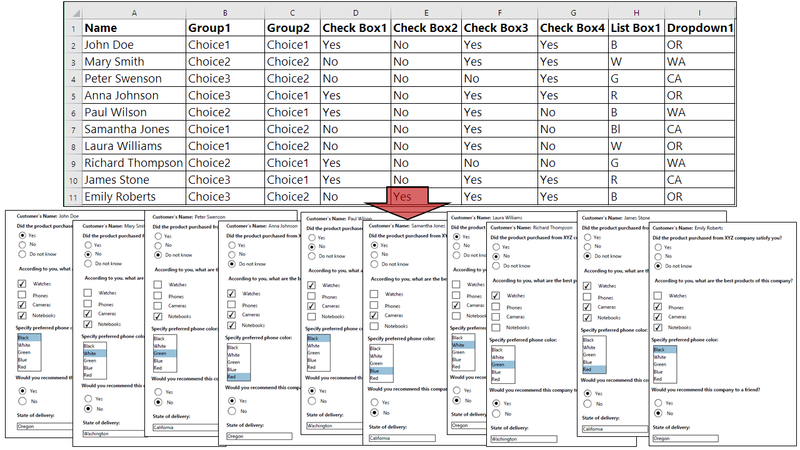 Radio buttons present a group of choices from which the user can select only one item. All radio buttons with the same name work together as a group. Select an existing PDF file that will be used as a template for the PDF form. Click the "Add radio buttons" icon from the menu. Move cursor to a page location where you want to place a radio button field. Click on the page where you want to place radio buttons. Enter a radio button name. This name will be used as an export value. By default the Adobe® Acrobat® defines export value for a new radio button as text "ChoiceN" in the group. Note that at least 2 buttons needed for the radio group. Click "Add Another Button" to create one more radio button. Enter a "Group Name" that will group the buttons together. A group name is used to uniquely identify each group on a PDF form. It is a good idea to use the same group name for both form and data fields to simplify the field mapping. Click "All Properties" to specify radio button properties. If editing an existing radio buttons, place a cursor over it and click a right mouse button. Select "Properties..." from the popup menu. Select the "Options" tab on the "Radio Button Properties" dialog. Select a button style. Specify an export value in the "Radio Button Chioce:" field. Use this text to check this particular radio button or change it to a different value as necessary. Click "Save file" to save changes to the file. List boxes display a list of options the user can select. Select an existing PDF file that will be used as a template for the PDF form. Click the "Add a list of choices" icon from the menu. Move cursor to a page location where you want to place a list box. Click on a page where you want to place a list box. Enter a list box name. A list box name is used to uniquely identify each list box field on a PDF form. It is a good idea to use the same name for both form and data fields to simplify the field mapping. Click "All Properties" to specify list of choices properties. If editing an existing list box, place a cursor over it and click a right mouse button. Select "Properties..." from the popup menu. Select the "Appearance" tab to specify border style and fill color. Specify text style. Select the "Options" tab page on the "List Box Properties" dialog. Enter items that will be used as the options for the selection. Enter the item names and export values. Press the "Add" button to create a new choice in the "Item List". Check the "Multiple selection" option to enable multiple selection from the list. In the example, we have created 5 items with the following export values: Black - B, White - W, Green -G, Red - R, Blue - Bl. Populate the list field with a text value that matches one of the export values to select an item from the list. For example, fill the list box field with "R" to select "Red". How to create a dropdown list? Dropdown list is used to make a selection from a popup menu or type a text. Select an existing PDF file that will be used as a template for the PDF form. Click the "Add a dropdown list" icon from the menu. Move cursor to a page location where you want to place a dropdown list. Click on a page where you want to place a dropdown list box. Enter a dropdown list box name. A dropdown list box name is used to uniquely identify each list box field on a PDF form. It is a good idea to use the same name for both form and data fields to simplify the field mapping. Click "All Properties" to specify dropdown list properties. If a dropdown list box was previously created, place a cursor over the dropdown list box field and click a right mouse button. Select "Properties..." from the popup menu. Select the "Options" tab on the "Dropdown Properties" dialog. Enter items that will be used as the options for the selection. Enter the item names and export value. Press the "Add" button to create a new choice in the "Item List". Check the "Allow user to enter custom text" option to allow users to type custom text into the field. In the example, we have created 3 items with corresponding export values: California - CA, Oregon - OR, Washington - WA. Populate the field with a text value that matches one of the export values to select an item from the list. For example, fill this field with "CA" to select "California". Use the AutoMailMerge™ plug-in to automatically produce multiple PDF documents by filling PDF forms with data from a spreadsheet or data file. You can download trial versions of both the Adobe® Acrobat® and the AutoMailMerge™.